Manufacturing of Custom labels, Tags and Safety Signs for the Industrial and Automation Industry. Established in 1986, PBS Engraving has been a leading company in the engraved identification products industry. 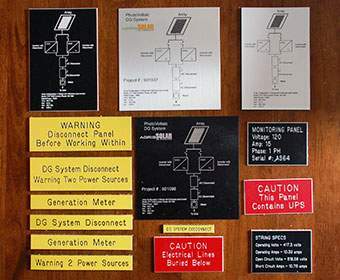 Custom lamacoid labels, tags and safety signs for the industrial and automation industries are manufactured using state of the art, computerized engraving equipment. PBS Engraving is a custom shop. If you do not see what you are looking for, please contact our office so that we can assist with the most economical solution for your application. Service and quality is something we pride ourselves on. Customer service is not a department…it’s an attitude. To learn how PBS Engraving can help your company by manufacturing customized, engraved labels or assisting with unique signage needs, please call us directly at 905-786-2068.